Today marks the 330th anniversary of the publication of Sir Isaac Newton’s Philosophiæ Naturalis Principia Mathematica (often referred to simply as the Principia). 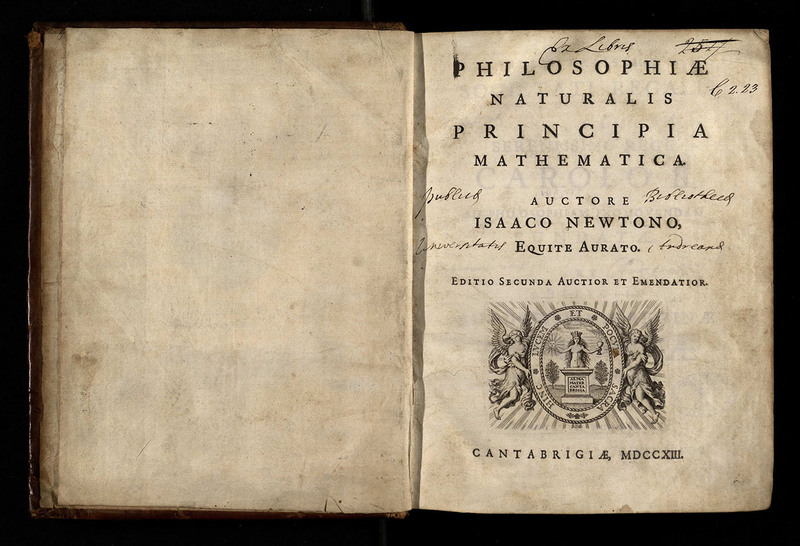 First published on July 5th 1687, the Principia went on to dominate scientific thought for centuries after its publication. The Principia was ground-breaking in both what it proposed and the methods employed within it. Newton’s concept of gravity went against the centuries-old Greek philosophical tradition of splitting the universe into ‘the heavens’ and ‘the earth’ with different laws governing each. He did this by postulating that the same gravitational force applied everywhere. The Principia not only described the world mathematically as previous works had, but used mathematics to predict how the world should behave, given a certain mathematical description of forces. For these reasons, the Principia is widely considered one of the greatest, if not the greatest scientific text ever written. It began life, however, as a nine-page tract. 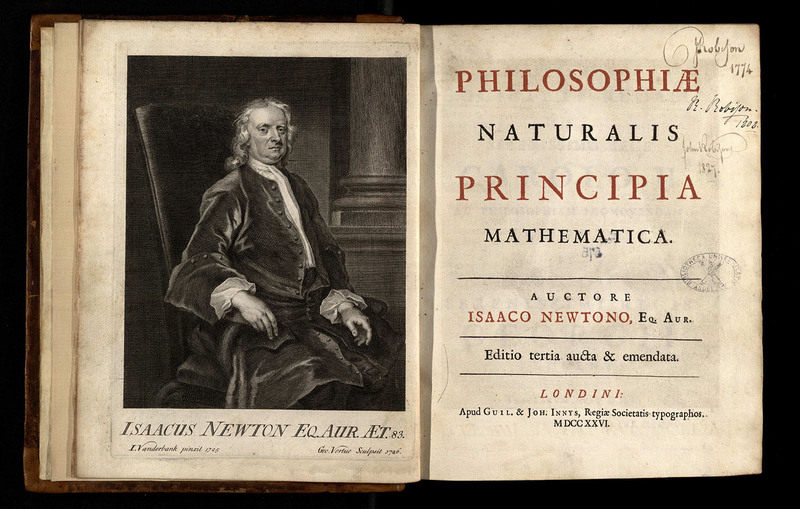 Only a few hundred first editions were produced and in order to publish it, Newton had to rely on funding from a friend – two of the surviving copies of the first edition are held in the Special Collections Division of the University Library, with different provenances, along with copies of the second and third editions. The first edition was published in 1687 and copies had a simple title page, with black ink and without pictures as shown in the image from Special Collections below. By the time the second and third editions were published in 1713 and 1726 respectively, the Principia was sufficiently renowned that publishers were able to add pictures and coloured text to the copies, knowing that the more expensive copies would still sell. In 1684, the humble nine-page tract, De motu corporum in gyrum (Of the motion of bodies in an orbit), made its way from Newton to Edmund Halley (later Astronomer Royal, and discoverer of Halley’s comet) who had requested it to solve a problem of planetary motion that neither Halley, Christopher Wren nor Robert Hooke could solve. The solution contained in the tract excited Halley so much that he visited Newton again to request more of such work to present to the Royal Society. While the tract was written to show that the elliptic orbit predicted by Johannes Kepler was consistent with an inverse square law (an inverse square law is one in which the force varies inversely with the square of the distance from the object), after Halley’s encouragement the tract was extended into three books to become the Principia. Every body perseveres in its state of being at rest or of moving uniformly straightforward, except in so far as it is compelled to change its state by forces impressed. A change in motion is proportional to the motive force impressed and takes place along the straight line in which that force is impressed. To any action there is always an equal and opposite reaction; in other words, the action of two bodies upon each other are always equal and always opposite in direction. Newton had originally planned to produce two books rather than three, and their drafts correspond to Books I and III of the Principia. Book II was added later with a somewhat different purpose. René Descartes had proposed a Theory of Vortices in 1644. This view had been circulated and accepted by many. Descartes’ theory relied on space being filled with matter, and Newton, who believed space to be largely empty, sought to disprove this theory. 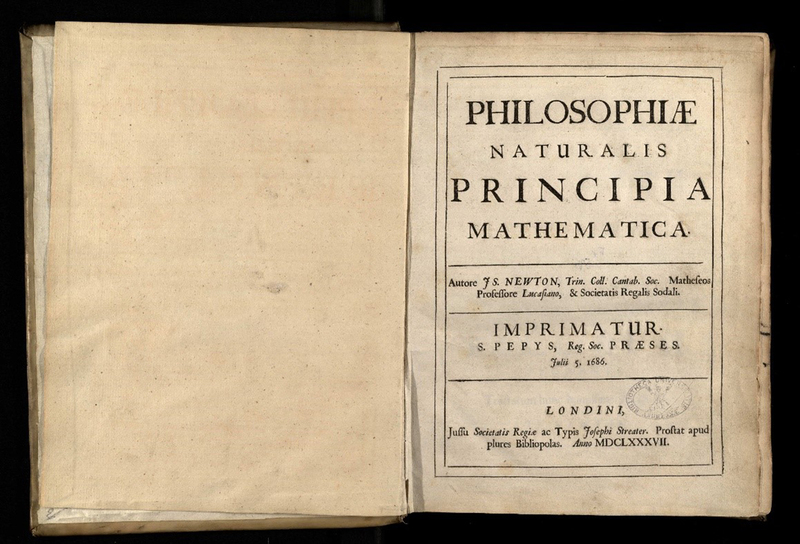 The title of his book Philosophiæ Naturalis Principia Mathematica was chosen to mimic Descartes Principia Philosophiae, something his readers would have recognised. You can see Descartes influence on the title pages of Newton’s Principia (see pictures above) as the words Philosphiae and Principia are written in larger text and (in the third edition) in red ink. Book III consists of four main parts: the derivation of the law of gravity; implications of this law; equinoxes and lunar derivations; and a solution for comet paths. Book III is different to Books I and II in that it ties theories to observations. The first 400 of the 547 pages of the Principia (Books I and II) are mathematical and it is not until Book III that the text makes extensive use of astronomical data. Some of these tables of data can be seen below (taken from the second edition of the Principia). Many mathematicians such as Christiaan Huygens and Gottfried Leibniz disliked Newton’s proposal that attractive forces act instantaneously over vast distances and that Newton had not provided a mechanism by which gravity acted. A few years after the first edition of the Principia, Leibniz published an improved vortex theory that was consistent with Newton’s conclusions that elliptical motions follow from an inverse square law. Newton included what is known as the General Scholium in the second edition at the end of Book III to defend his ignorance of a mechanism by which gravity acts – this is where his famous line “Hypotheses non fingo” is written. He also added further arguments against vortex theories in Book II. Aside from omitting a mechanism, there were still holes in Newton’s work, such as his incorrect prediction of the moon’s orbit. This was not enough to derail his theory, and resolving these problems preoccupied those interested in Newtonian Mechanics for the coming decades. The publication of the Principia was not a smooth process. Unfortunately, the Royal Society had spent its entire printing budget on the unpopular De Historia Piscium (History of Fishes by Francis Willughby) and as a result they were unable to pay for the Principia’s publication. The history of science could have been very different had Halley not offered to finance the Principia’s publication. Amusingly, at the end of the year, the Royal Society did not have the funds to pay Halley his annual salary for his role as the society Clerk, and instead paid him in unsold copies of the History of Fishes. Despite his phenomenal contributions to science and mathematics, during his later years, Newton sadly spent little time on mathematics and science, being appointed became Master of the Mint in 1699 he died in 1727 at the age of 84. This blog was written by Gemma Talbot and Ian Shand, both studying for a Masters degree in Mathematics and Theoretical Physics. They have spent this summer exploring the History of Astronomy under the supervision of Isobel Falconer and Edmund Robertson. Gemma and Ian say: ‘MacTutor is a Mathematical Biography Archive which was developed by John O’Connor and Edmund Robertson. Because of the rich links between astronomy and mathematics, there are a number of mathematicians in the archive who made important contributions to astronomy. Our work included cataloguing these mathematicians so they could be easily found and writing essays that introduced the development of key astronomical ideas. These include how our view of the solar system developed from Pythagoras to Newton and the size of the Milky Way galaxy from the Babylonians to Hubble’. ← Lighting the Past Goodbyes! I for one would like to have been told something of the provenance of the two copies of the first edition held in the Special Collections. For those lovers of St Andrews, as well as lovers of books, such information is imperative. Speaking for myself, it is one of the first pieces of information I seek, after informing myself about the book/s in question. Thank you for your comment. One of the first editions is part of the Forbes Collection and the other is in the Reserve Collection. Provenance details for both copies can be found in the catalogue entries here and here. If you would like to discuss these texts in greater detail with our Rare Books librarians, please do not hesitate to get in touch (speccoll@st-andrews.ac.uk).